Linked tables are Access objects that behave like tables, but are in fact references to tables that live outside your current database. 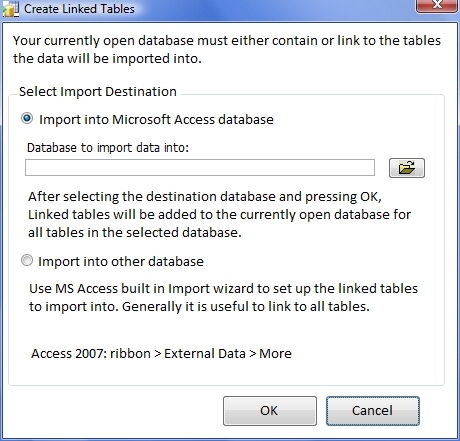 You can use linked tables to other MS Access databases, SQL-server, Oracle, Excel tables, text files and others. All of them can be used to read from (Sources), but only the real databases can be written into (can be the Destination). 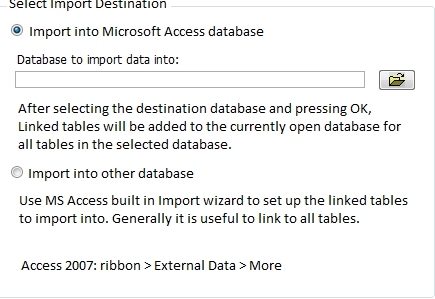 In Setting up a new Import system it is described how using linked tables makes it possible to work with the Import and Validate software without having to make a change to your production database. The dialog below automatically opens if you Start Import and Validate in a database that does not yet contain tables. This is to make it easier to create an Import database.